These tips will help you survive the day when you're running on empty. Sleepless nights happen to the best of us. Maybe you tossed and turned all night long, were up working on an urgent deadline or had a bit too much fun celebrating last night and it ate into your shuteye. Whatever the case, the reality is that you still have to face the next day on little to no sleep and still function at an acceptable level. "When you don't get enough sleep, your brain doesn't function at optimal speed," says Leigh Winters, a neuroscientist and wellness expert. "Brain imaging research shows that sleep deprivation results in reduced blood flow to areas of the brain, like the prefrontal cortex [that's] responsible for higher level thought processes like working memory. It's also likely to make you more irritable and prone to mood swings." Getting through the day is bound to be a struggle. That said, it's still possible to power through, and do it as productively as possible, until you're finally able to crash into the sweet softness of your mattress. "Nature is one of our most underutilized self-soothers both physiological and psychologically," notes Winters. "Connecting with nature and being in fresh air can make you feel more awake. Also, getting some natural sunlight helps maintain circadian rhythms, which will help get your sleep schedule back on track." She added that while blue-wavelength light — like that emitted by our phones and computers — can mimic natural light, actually being in nature can reduce your heart rate and stress levels and mentally invigorate you. Your tired body will crave an easily digestible and quick high, but with that high comes a gnarly crash, warned registered dietitian Maya Feller. "Skip the ultra-processed foods and beverages," she advises. "They may sound good in the moment but will likely provide a rush of unsustained energy that may leave you more tired and hungry. It's a cycle that your already tired body does not need." You should eat balanced meals every day, but doing so becomes doubly important on days when you're completely wiped. "Create meals that supply all of the macronutrients from whole and minimally processed sources," says Feller. "A great lunch would be a serving of fish — or really any protein of your choice — with a heaping side of greens topped with nuts and seeds." An optimal afternoon snack, she adds, could be a slice of traditional dark pumpernickel bread topped with avocado and hummus. "The lunch is providing lean protein along with a boost of phytonutrients from the greens; the snack is providing a fiber-rich whole grain with plant-based fats and vitamins and minerals," she explains. On that note: Don't forget to eat altogether. It may slip your already groggy mind, so create an alert on your phone if you have to. "Skipping meals leads to glucose dips and increased moodiness," notes Feller. Spare your officemate and family the extra dose of crankiness and carve out time to chow down. 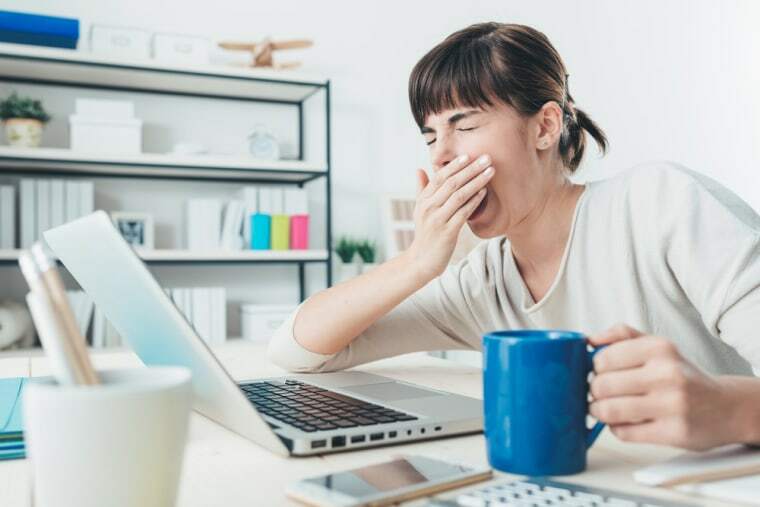 "A power nap can be of value when there is an occasional interruption from the normal schedule of sleep," says Dr. Steven Olmos, who is board certified in sleep-related disorders. "The greatest pressure to sleep is 4 a.m. and 4 p.m., so if you are feeling an afternoon dip in energy, a quick nap can restore the body fatigue that is felt with the previous night's interrupted sleep." A power nap is simply 20 minutes of uninterrupted, comfortable sleep — no more, no less. It may seem counterintuitive to hit the gym when you're already low on energy, but all three experts say staying active can keep you alert. "Starting the day with your blood pumping is the best formula for energy for the day. Exercise increases your core metabolic rate and will sustain for hours after you stop exercising," notes Dr. Olmos. Winters adds: "It can be a walk or dancing around — just make sure to move your body. It's a bonus if you get your fitness on outside." "Go easy on the caffeine," Feller warns. "Yes, it will give you a boost, but for those that are sensitive to the side effects, having too much can lead to the decreased desire for food, the jitters and difficulty sleeping." Coffee or tea should be your moderated caffeine of choice, she says, adding that you should stay far away from sugar-doused energy drinks because "the additives are more harmful than helpful." The quote "Don't push off what you can do today until tomorrow" does not apply when you're sleep deprived. "If you pulled an all-nighter or have an enormous sleep debt, think twice about making any big decisions or engaging in high-level thought processes, like analyzing, evaluating and planning," says Winters. "Sleep deprivation not only slows your cognitive speed but also decreases constructive thinking skills and logical reasoning." So refine your to-do list, push off non-priority tasks until tomorrow and allow yourself an easier day.